No matter how hard you try to set your hair perfectly, humidity can play spoilsport, ruining your mane game! And while you can’t do much about weather conditions, you can totally tackle frizzy hair with the help of some store-bought products. Talking about anti-frizz hair products—there are now sheet masks that aren’t for your face, but for your hair. These give your hair a dose of hydration, making them silky smooth even in humid weather conditions. Here’s a list of some of the best hair masks and sheet masks that promise to give you frizz-free hair! Thanks to the hydrating and nourishing properties of sheet masks, they take care of those pesky fly-aways that form from breakage or hair damage. Simply use this beeswax and Brazilian pracaxi oil sheets directly on dry hair to tame that frizz. It works on all hair types to help smoothen and strengthen the hair. With shea butter and coconut oil, these sheets are a godsend for a bad hair day. Take out a sheet and literally swipe this hemp paper on your strands. You will see the difference instantly! This banana hair mask by The Body Shop is all natural and uses organic banana puree and Brazil nut oil that leaves your hair feeling ultra nourished. It’s special formula makes hair shinier and less frizzy, perfect for those who have naturally wavy hair and need some control over their locks. These little hair sheets keep your gorgeous curls intact and prevent them for losing their shape. According to Elle.com, Khloe Kardashian uses these sheets to tame her curls. Nunzio Saviano’s hair sheets are enriched with coconut oil and non-sticky polymers that keep curls locked in and eliminates frizz. The stronger your hair is, the less likely it is to break (leading to flyaways) and be frizzy. This mask by Tjori that is enriched with rosemary and hibiscus helps to stop hairfall and encourages regrowth. It is also said to prevent premature greying, which is a huge plus for ladies in their 30s. Dry and damaged hair tends to look frizzy, so what better way to prevent that, than a nice pre-shampoo mask. 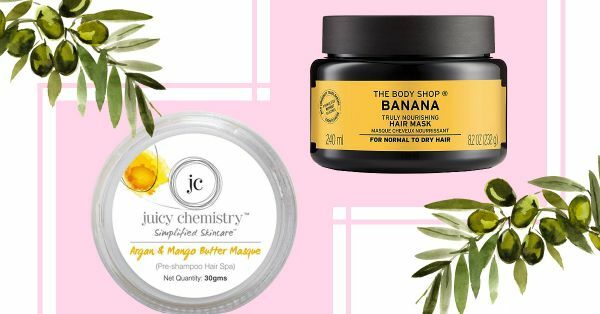 This one by Juicy Chemistry uses the goodness of argan oil and mango butter to soften hair and reduce frizz. These set of hair wipes are super small making them bag-friendly. Made with camelia oil and avocado oil, swipe only on length for salon-like hair. If your hair has gone through harsh chemical treatments and colour, which has caused it to become brittle and unruly, it’s time to fuse as much moisture and nutrients to restore its health. The Moroccan Argan Hair mask by Arganic treats curly, frizzy hair that has been over exposed to these treatments by pampering it with its nutrient rich blend. Really damaged and dry hair that has been put through the ringer of heated styling tools, harsh products and just general damage is susceptible to frizz. Give it tons of care and moisture by using Naturica Repair Intensive Mask which is specially designed for ‘very dry, damaged’ hair. It is said to restore hair from within and help you nurse it back to life. If it isn’t just frizz, but also split ends, dryness, damage and breakage that’s an issue, then you need a hair mask that treats all of it. The Reconstruction 7 hair mask by Avon aims to do just that. Its formula tackles all these common issues and restores damaged hair within minutes (they claim)! So why not put it to the test? Frizz-free hair needs a balanced and healthy scalp to stay that way. This mask by Richfeel harnesses the regenerative properties of the Brahmi plant. It is said to strengthen and condition hair but also relaxes your scalp, giving you longer, frizz-free luscious hair. Frizz is a really hard thing to get rid of, so, we hope using these masks once or more times a week will help reduce, if not eliminate this issue. However, no matter how frizzy or unruly, embrace your hair’s natural texture as long as it is healthy!